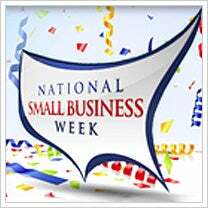 President Barack Obama has declared June 16-22nd as National Small Business Week (NSBW). Since 1963, the President of the United States has issued a declaration that we recognize the essential contributions made by small business owners and entrepreneurs in the United States. While many things have changed since President John F. Kennedy signed the first Presidential Proclamation for National Small Business Week in 1963, America’s entrepreneurial enthusiasm and the importance of small businesses within our economy hasn’t changed. Currently, more than half of Americans either own, or work for a small business. These small businesses create approximately two out of three new jobs each year in the U.S.
“Small businesses are critical to our economy, they’re our key engines to growth and job creation,” said President Obama. The U.S. Small Business Administration (SBA) considers National Small Business Week as an opportunity to showcase the impact of these impressive entrepreneurs and small business owners. Each day they’re working to grow their small businesses, which create more jobs in the 21st Century and increase America’s global competitiveness. The growth of the U.S. economy is dependant upon the success of small businesses; for generations, Americans have worked hard to achieve their dreams of owning their own business. During National Small Business Week, we recognize the hard work and perseverance of these individuals. During National Small Business Week each state selects and names a Small Business Person of the Year, who goes on to compete for the national title. On June 21st, the final day of the weeklong event, winners from each state will meet in Washington D.C. to see which of them will be named National Small Business Person of the Year. The NSBW awards ceremony in D.C. on June 21st will be the concluding event for the week. While National Small Business Week focuses primarily on recognition, it’s also a chance for small business owners and entrepreneurs across the U.S. to network and gain insight on some of the biggest concerns for small businesses. If you’re unable to attend this year’s events, remember that many of the key addresses will be streamed live here via the SBA website, on Monday —Thursday, at 4 p.m. ET. There will also be a Google+ Hangout, which will be open to any businesses that would like to join. Speaker and schedule information for all of the events will be updated regularly. Click here for schedule information and speaker information. We urge you to attend as many of the main events as possible, and show your support for small business owners and entrepreneurs during National Small Business Week!